This is the first story in a three-part series profiling the United States Digital Service (USDS) and its team at the Homeland Security Department (DHS). Read part two here. People visiting the United States Digital Service’s headquarters quickly realize that the USDS isn’t like other federal agencies. 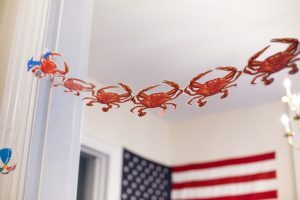 A chain of crabs at the USDS headquarters in Washington, D.C. It might be the environment – part college dorm, part mission control. 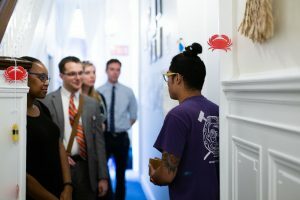 It might be the culture; USDS employees wield emojis like a second alphabet, and they love collecting totems resembling the agency’s unofficial crab mascot. Or it might be USDS’ unique approach to government, one that combines the latest in design and technology for the most functional public services. Federal IT modernization is a hot topic this year and improving the government’s digital services is a driving force behind that interest. USDS’ Fall 2017 Report to Congress estimated that its current projects will save the federal government $617 million over a five-year period. They will also redirect 1,475 labor years towards higher-value work over the same period. USDS was founded in August 2014 during former President Barack Obama’s administration. The agency quickly made a name for itself by revamping HealthCare.gov so that its design and infrastructure were simpler for users. The changes to the federal government’s online health insurance exchange were transformative, and they ultimately helped 8 million Americans sign up for healthcare coverage during the 2013-2014 open enrollment season. 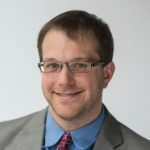 The overhaul solidified USDS’ methods, and it now applies the same approach to projects across the federal government. USDS pairs the best and brightest technologists with top federal employees, combining their talents on major challenges facing America. The agency’s current portfolio includes projects at four DHS components and three other federal agencies. GovLoop’s staff tours USDS headquarters in Washington, D.C.
USDS recruits top designers, engineers, product managers and digital policy experts, bringing private sector ingenuity to public sector obstacles. Employees consult other federal organizations on IT, with an emphasizing at boosting digital government services and websites. USDS employees enlist for initial two-year stints followed by an optional two-year extension. This short lifecycle encourages agility and creativity, resulting in quick innovations for thorny problems. USDS’ team has an unusual mindset focused on teaching new approaches to career civil servants needing fresh perspectives. The strategy is a result of USDS’ term limits, and it forces recruits to think beyond their tenures. Punteney has implemented USDS’ philosophy on his project, which centers on modernizing FEMA’s grants system. It combines FEMA’s multiple grants system into one platform, reducing duplicative recordkeeping and streamlining the agency’s housekeeping. Liz Odar, USDS’ Director of Asylum at DHS’ U.S. Citizenship and Immigration Services (USCIS) component, has also expanded her agency’s portfolio by improving the immigration paperwork process. The project modernized green card renewal and replacement for immigrants. Green cards grant immigrants lawful, permanent residence in the U.S.
USDS’ work on the I-90 dramatically reduced the time users are spending on the green card forms, with the best result for card production being about four hours. Neill said that the outcome captures her agency’s spirit – helping other federal organizations thrive once USDS is gone.